The Mississippi River flows through Minnesota, Wisconsin, Iowa, Illinois, Missouri, Kentucky, Tennessee, Arkansas, Mississippi, and Louisiana. The Mississippi River's main tributaries include the St. Croix River, Wisconsin Rover, Rock River, Illinois River, Kaskaskia River, Ohio River, Minnesota River, Des Moines River, Missouri River, White River, Arkansas River, and the Red River. A drop of rain that lands at the mouth of the Mississippi River will take 90 days to reach the basin. 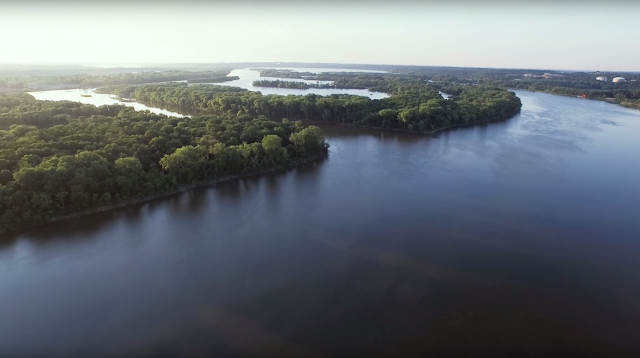 There are more than 360 fish species, 325 bird species, 50 mammal species, and 145 amphibian species living in and around the Mississippi River. More than 25% of North America's fish species can be found in the Mississippi River. The river corridor is extremely important to migratory birds as well. Steamboats were used until approximately 1910, for transporting people and goods. The Mississippi River's deepest spot is located in New Orleans near Algiers Point. The river is approximately 200 feet deep there. The first bridge built to cross the Mississippi River was constructed in 1855. The next year the first railroad bridge crossing the river was built. The average flow rate at the Mississippi River's mouth is 6 cubic feet per second, while the average flow rate at the basin is 600,000 cubic feet per second. In 2002 Martin Strel swam the entire length of the Mississippi River. It took him 68 days. Life on the Mississippi is a book written by Mark Twain in reference to the steamboat era between 1830 and 1870. Most of Mark Twain's work involved the Mississippi River in some way, either as the setting or part of the story. The Mississippi River became the Spanish/British border in 1763 as per the Treaty of Paris. The name Mississippi is derived from the Ojibwe word 'misi-ziibi' which means 'great river'. In the 1600s Jacques Marquette and Louis Jolliet further explored the Mississippi River, guided by Ne Tongo, a Sioux Indian. Hernando de Soto named the river Rio del Espiritu Santo, which means 'river of the Holy Spirit'. Hernando de Soto, a Spanish explorer, was the first European to record reaching the Mississippi River. He arrived on May 8th, 1541.